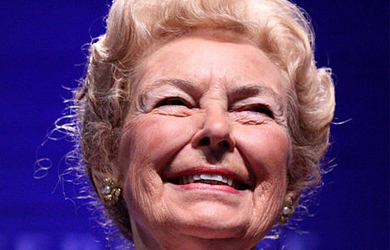 Schlafly has previously said that Latino immigrants “don’t understand” the Bill of Rights. The veteran activist said she has talked to many immigrants who came to the U.S. as teenagers two or three generations ago. Their parents taught them to leave their native ways behind and fully immerse themselves in America. 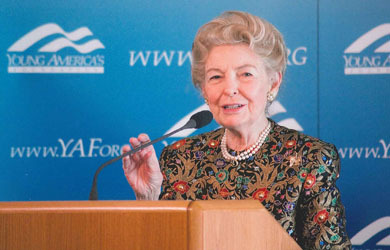 But conservative icon Phyllis Schlafly believes Obama and Attorney General Eric Holder also used the Michael Brown shooting in Ferguson, Missouri, for political purposes. “I think that Obama and his attorney general really fomented [unrest] in order to hopefully win the election on November 4,” Schlafly said. “They wanted to inflame people in order to get their voters out to vote. I think it was deliberately done, and they weren’t content to just let the process take its course. “I think it has backfired, and the Republicans won a tremendous victory despite everything,” she added. A grand jury is deciding the fate of Officer Darren Wilson. An announcement on whether there will be charges could come any day. Schlafly, whose recently published book “Who Killed the American Family?” came out just days before she turned 90, said Obama and Holder will be culpable if riots break out in Ferguson. “But whether the public will see it that way, I don’t know,” she said.